For some people, Christmas lights are an essential piece of the holiday season. For others, they’re a way of life. Get any seasoned light installer talking about their craft, and you’re sure to hear a barrage of unfamiliar terms, strong opinions, and unmitigated passion for their favorite hobby. 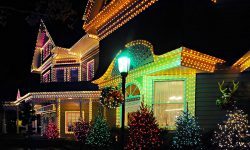 But whether you’re a Christmas enthusiast on a mission to make your house visible from space, a homeowners association with an eye for the festive, or a business owner looking to jazz up your storefront, it pays to learn everything you can about the Christmas lights you’re buying. If you’re looking to master the art of Christmas installation and bring your displays to the next level, read on. We’ve compiled absolutely everything you need to know in a single place, with handy links for further exploration. Before we start getting into the nitty gritty, we need to address the clan of stubborn folks still clinging to their outdated, incandescent mini lights. Even today, when LEDs are more advanced than ever before, some people still believe their old bulbs are superior. Back in the day, this was certainly true. When LEDs first became practical for consumers around 2006, most emitted an ugly blue hue. They used less power, sure, but they were unreliable, unwieldy, expensive, and often less vibrant than their incandescent counterparts. As a result, many enthusiasts refused to adopt the tech, and their anti-LED attitude continued for years to come. But today, LED technology has evolved far beyond its humble beginnings. Even the most basic big-box LED sets emit accurate colors at decent brightness. And when it comes to professional-grade LEDs, there’s just no competition. LEDs consume way less energy, saving you as much as 90% on energy bills. LEDs boast superior illumination intensity and color accuracy, and don’t fade over time. LED bulbs are virtually indestructible, and last much longer than incandescent bulbs. LEDs offer a wider range of designs, giving you more flexibility with your displays. LEDs allow you to connect many more sets together without fiddling with extension cords or vampire plugs. Each of these, as well as the fact that you can almost perfectly emulate the look of incandescent lights with LEDs if you so choose, make the switch to LEDs a no-brainer. The only potential barrier to LEDs over incandescent lights is their higher initial cost. 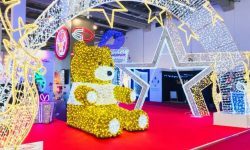 Rest assured, though, that the energy savings, longevity, and sheer brilliance LEDs will lend to your Christmas displays will pay for itself over just a couple seasons. Do be aware, though, that many suppliers overhype how long their bulbs will last. While those LED bulbs you’re buying may be rated to last 75,000 hours, this is just for the LED diode. In nearly every case, the construction of the LED set will fail long before the diodes do. That’s why it’s so important to buy light sets made with quality components and good solder connections. 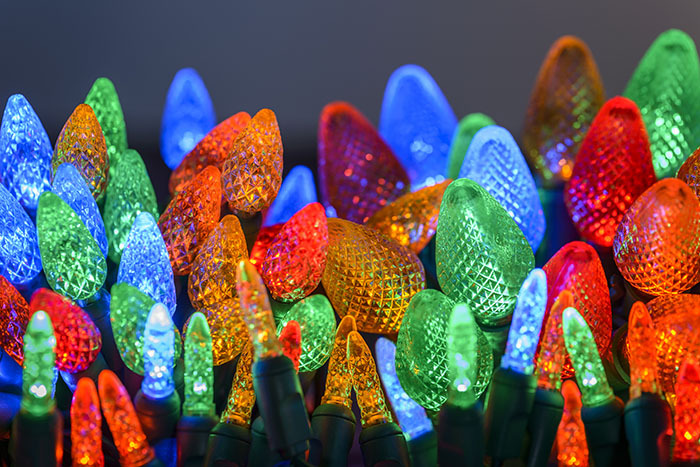 If used seasonally and appropriately stored in the interim, high-quality LED Christmas light sets should last around five to six years. Have you ever spent hours toiling away on your lights only to be upstaged by your neighbor’s brighter, clearer, and more vibrant display? If so, retail grade lights are probably to blame. Not all Christmas lights are created equal. 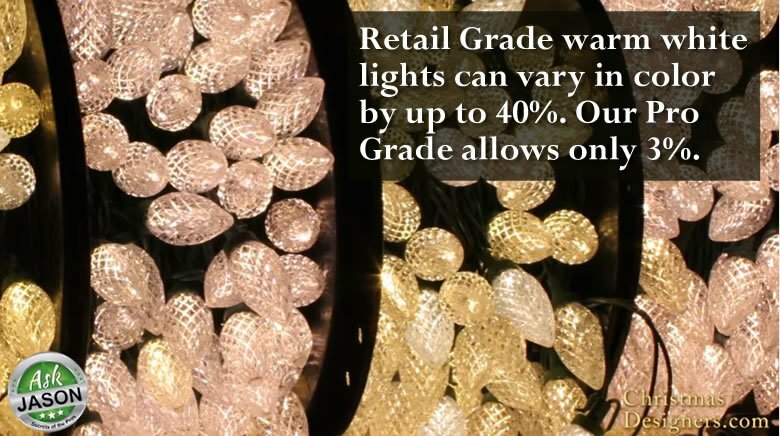 Industry insiders and Christmas display enthusiasts break LED Christmas lights into two categories: professional grade and retail grade. 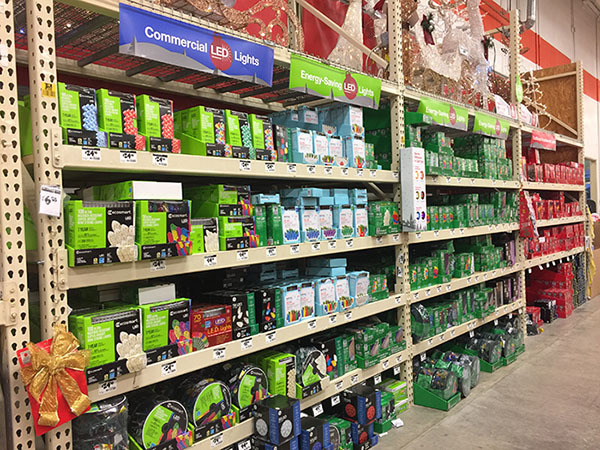 While some big box stores will try to sell you “commercial” grade lights, don’t be fooled — most of these are nothing more than a retail grade set with a higher markup. 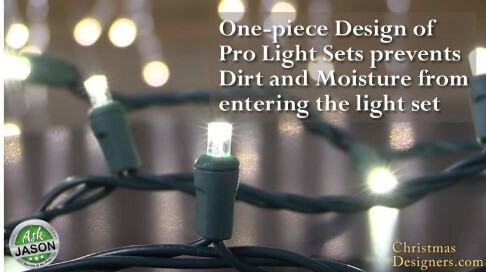 Pro grade LED Christmas lights use a one-piece bulb and lens design. Because they combine the LED diode and the lens into a single sealed socket, pro grade lights last much longer. Their tight design prevents debris from making its way into the lighting set and causing it to fail. Retail grade lights are manufactured in two pieces, with a separate bulb and lens. This allows you to remove and replace the LED diode. You might think this is actually more convenient, except for the fact that their two-piece design inevitably lets in unwanted dirt and moisture, meaning you will need to replace the diodes, and the entire set, far more often. This makes pro grade lights more cost-effective in the long run. Pro grade lights use better electrical components. While it’s hard to tell from a glance, true pro grade LED lights are equipped with significantly superior internal electrical components, including the LED diodes. LED lights are small, but electrically complex — these things really do matter. Pro grade lights provide much better color consistency. Maintaining color consistency across light sets has always been a problem with LED sets, especially with warm, white lights. But with modern, pro grade LEDs, the issue is rarely noticeable with the naked eye. Pro grade light strings are shorter, making them more flexible and easier to manage. In the retail market, it’s easy to find light sets longer than 50 feet. These big, unwieldy strings might seem like a decent value, but in reality, they’ll cause you a big headache down the road.Professional installers usually keep strings around 25 feet, or 33 feet at the absolute longest. Long strings get tangled up easily, are heavier, and generally just worse to work with. For your own sanity, professional grade lights keep lengths reasonable.Now that you understand what you’re really getting when you buy professional grade, LED Christmas lights, let’s dig into the lights themselves. 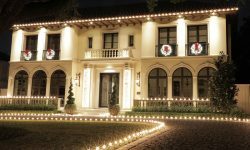 There are two primary types of light sets serious Christmas light experts use: stringers and empty socket lines. Stringer sets are the type most people think of when they picture Christmas light strings. 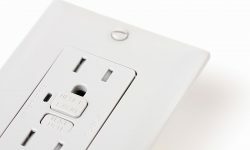 They come in a 3-wire configuration, with a number of bulbs directly attached, and a male and female plug on either side. These are the sets you’ll usually employ when you’re decorating foliage. Since they come in a predetermined length, complete with bulbs, they’re the easiest and most straightforward lighting option available. But that doesn’t mean they’re all the same. When considering the best stringer light set for the job, there are four things to consider: the bulb lens design, the number of bulbs per set, the bulb spacing, their color, and the type of connection they use. We’ll break down each of these considerations in the following sections. The lens design is what gives each specific type of LED stringer light its own particular flavor. While you’ll likely be working mostly with a 5mm Conical, it’s good to know all of your options and where they’re best used. Here are each of the available stringer bulb lens designs, from smallest to biggest. At first glance, these guys, usually just called “Conicals,” look a little diminutive and stubby, but plug them them in, and you’ll see just how powerful they really are. Clocking in at 25% brighter than your average incandescent mini light, there’s a reason these are the number one light used by professional installers worldwide, though they’re still vastly underappreciated among enthusiasts. If you haven’t used them before, I highly recommend it. Their only downside is that they’re so bright that they can be too much for interior applications. The M5’s elongated, faceted design makes for a classic look when lit up. Dimmer than the Conical, but excellent for outdoor foliage or greenery indoors. These are what you use when you want to get as close to the look of a traditional incandescent mini light as you can. Between this and the M5, it usually comes down to personal preference, but you can’t go wrong with either. The C6 is smaller than the ever-present C7’s and C9’s you see all over the place, but still with that large-bulb feel. Though they’re often considered a bit of an outcast in the lighting world, they shouldn’t be overlooked. Use them in indoors on artificial wreaths, trees, and garlands, or even in outside on the perimeter of your house for a crisp, clean appearance. Slightly smaller than the popular C9, C7 LED stringer sets are medium-sized, multipurpose lights. Though they’re cheaper than their C7 replacement bulb cousins, they are also less flexible. Still, an excellent budget option for decorating large outdoor trees or other similar applications. 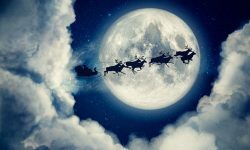 The C9 is the Christmas light as far as most people are concerned. It’s been in use for more than 90 years as a staple light in perimeter lighting. 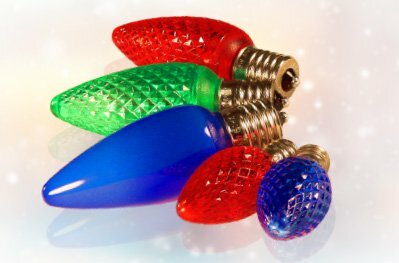 These are the bright, rotund bulbs you see everywhere during the Christmas season. Though again you should go with the C9 replacement bulb if you want to customize your line lengths to your property, the C9 stringer set should be your go-to for low cost use. Professionals make best use of them in the foliage of towering trees. When you’re new to the Christmas light game, it’s easy to think that the more bulbs on a string, the better. That’s why you can track down strings of LEDs at big box stores with more than 300 bulbs piled on. We already covered by long strings are a bad idea, but there’s another reason why cramming as many bulbs onto a string is a recipe for disaster. It’s important to realize that every bulb is a potential failure point. Instead of hundreds of bulbs, most professionals recommend buying strings with 70 to 100 lights, though if you have small sections to cover, you can easily go lower. Spacing between bulbs varies anywhere from 4” to 12,” but for home use there are a few general rules to follow. 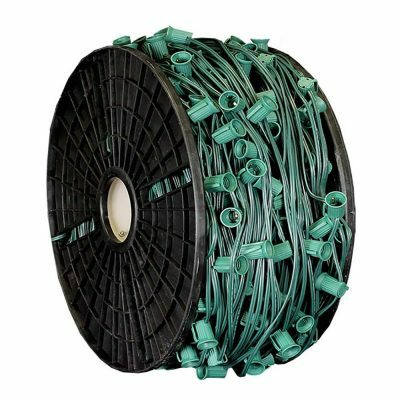 Go by application: 4” to 6” spacing should be used to wrap the trunks of trees, scatter lighting should be kept to 6” to 8”, and 8” to 12” is the standard for C7 and C9 stringer sets. Do not that the wider spacing options can make the string significantly longer. For this reason, most 6” sets are 50 bulbs, most 4” sets are 70 to 100. It’s a good rule of thumb to keep your sets around the 25’ mark. While most professional installers work largely in warm whites, when you’re setting up your own display, you’re only limited by your imagination. Today, there are all kinds of options, from the standby multicolor to pink, purple, and everything in between. If you’ve never used modern, pro grade LED lights, you’re in for quite a treat as you see just how vivid they can be. 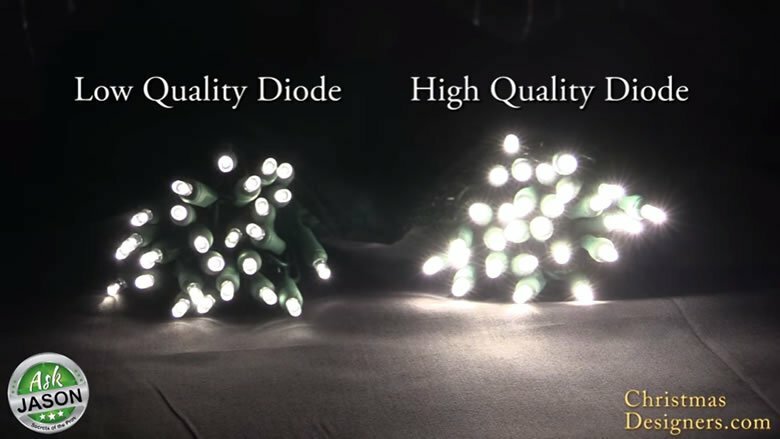 If you’re using retail grade LED Christmas lights, you will likely realize that the color consistency, especially with white lights, just isn’t there. Though you’ll still have to deal with a little variation, good pro grade lights allow around only 3 percent variation in color, which you won’t notice in practice. Now you’re all ready to pick up your first few sets of professional, self-contained stringer lights! 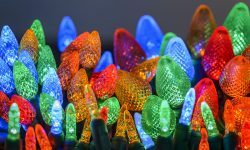 They’re a great low-cost, hassle-free options for those dipping their toe into the Christmas light world, and they’re essential for smaller lights. But when it comes to C7s and C9s, to get the absolute picture-perfect display of your dreams, you’re going to need a little more flexibility and customization options. That’s where empty socket light line comes in. Stringer lights are fantastic, but the fact is, you’re never going to get the absolute perfect length Christmas light lines for your house by fiddling with ready-made strings. As long as you stick to those, you’re going to have trailing ends and poorly-shaped sections. To fix this and ascend to the next plane of Christmas enthusiasts, you’ll need to go one step further with empty socket light line. for bulbs. You buy it by the foot, or in 500’ to 1,000’ packages. To actually use it, all you do is measure out the precise length you need, to the cord, affix a slide-on male and female plug, and screw in your chosen bulbs. It’s a lot less technical and intimidating than it sounds — read this guide if you don’t believe me. The ability to cut a line to the exact perfect length. The ability to choose whatever bulb colors you want, in any sequence. Superior bulb quality, with better brightness and color. Better reliability. Since LED retrofit bulbs are self-contained units, there aren’t any electronics to fail in the line. Of course, just like with stringer light sets, there are a few important things to think about as you’re picking out your socket line. First there’s the cord socket size, which will allow you do choose between C7 or C9 bulbs. The majority of the time, you’ll want to use C9 for perimeter lighting, but C7s can work well for smaller structures. Then you’ll need to consider whether you need SPT-1 or SPT-2, which refers to the thickness of the cord (0.3” insulation or .045” insulation, respectively). Unless you’re keeping your display up year-round, SPT-1 is probably the easiest bet. You’ve also got a choice of color for the cord. Just keep it simple, and stick with the traditional green, or maybe white if you’re feeling adventurous. You’ve also got to think about the maximum number of bulbs per line. The calculations can quickly get complex, but if you just keep in mind the numbers 500-300, you’ll be fine. If you’re using C7 or C9 bulbs, end your run at 500 bulbs or 300 feet at the absolute maximum, whichever comes first. We’re guessing you probably won’t have to worry. Then, finally, you’ve got to think about the socket spacing once more. Again, when you’re working with C9s, it’s best to stick to 12” spacing, but you can go smaller if you’ve got finer details to highlight on a structure. A quick note: when you go to buy empty socket light line, you want bulk line, not line with the plugs already molded on. The latter option is just like stringer lights without the bulbs — a set length, with no wiggle room. With light line, it all comes down to the bulbs. The cord carries the electricity, but it’s the LED bulbs that do all the heavy lifting, electrically speaking. So when setting up your first light set from line, bulb choice is paramount. As we’ve stated, you’ll mostly be working with C9s and the occasional C7s, but if you want to branch out, you can also use round bulbs like G30s, G40s, or G50s. 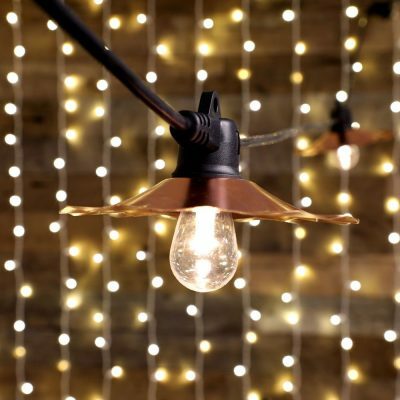 These are especially good for bistro-type patio lighting in your backyard, if you want a year-round application for your strings. In both sizes, you’ll have a few lens types to choose from. First there are the faceted lenses, which bounce the light around and more fully illuminate the bulb. Then there are the less common smooth surface options. The transparent smooth-surface bulbs are generally not at the level of their faceted counterpart. Smooth, opaque bulbs, however, can put out a lot of color in an increasingly popular throwback package. The most important consideration, though, is the bulb’s brand. All you really need to know about this is that Minleon, the most recognized and respected LED bulb brand on the market, Pro Christmas, and Opti Core all make excellent bulbs. Anything outside of those three brands and you’re rolling the dice. If you do buy off the beaten path, make sure to do your research. Many an enthusiast has been burned months after buying a bunch of expensive bulbs, only to have them fizzle out much earlier than expected. If you’ve gotten this far, chances are you’re more interested in Christmas lights than your average neighbor. So go ahead, dip your toe in. Buy a stringer set here, set up your first socket line — just keep your head about you. Once your display is up and you bask in the glory of all your professional grade, LED Christmas lights, that immense sense of satisfaction can lead you down a slippery slope. This stuff is addictive, after all — why do you think we do it?